Is this the most powerful home wireless network adapter ever? 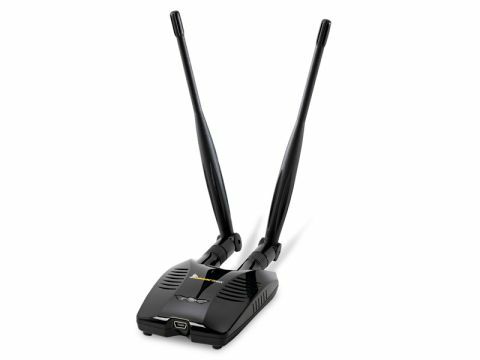 High-powered external Wi-Fi adapters such as the Janus WLAN USB adapter can greatly extend the reach of your wireless network – HornetTek claims a range of up to 1,000 meters. It maintains a strong wireless signal in taxing conditions too. Connecting to your Mac via USB, setup isn't helped by a complete lack of Mac instructions and a software CD that hides the OS X version of its WLAN management app in a folder marked 'Other drivers'. If you've set up wireless networks before, getting it up and running shouldn't be too problematic, but beginners should wait until HornetTek publishes a decent tutorial. The device sits neatly on your desk, but could use a bracket to mount it on your MacBook's lid. In our tests, Janus did exceedingly well, outperforming its rival USB highpower wireless adapter Wi-Fire. With our router in a thick-walled Victorian house, it achieved a 95% signal strength from the garden shed, while Wi-Fire managed less than 20% and AirPort failed to connect at all. It regularly found substantially more networks, and in our Ping test, was 44.8% faster than AirPort and 36.8% speedier than Wi-Fire. HornetTek Janus High Power 802.11 b/g/n WLAN USB Adapter is ideal for situations where you struggle to get a wireless connection. Just make sure you know how to set it up before you buy.